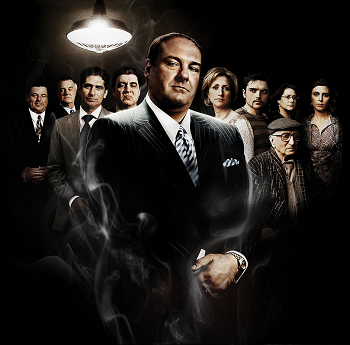 Con Men and Gentlemen Thieves are the most popular, since it's easy to make them sympathetic to the audience by making their victims rich and greedy. They are also usually charismatic and attractive. Their shows are usually light in tone and there will almost certainly be one episode where they actually help the police to take down a violent (and therefore "bad") criminal. There may be a recurring police officer who tries (and fails) to capture the protagonists, or who coerces them into helping him out with his investigations. Exactly What It Says on the Tin, a fishing episode will involve the protagonists going fishing. The fishing trip will often be an excuse for a character to try and bond with their parents. Compare Fishing Minigame, for when this trope is used in video games, and Camping Episode, which revolves around another typical outdoor activity. Also compare Heroes Gone Fishing, for when a hero goes fishing to take a break from crime-fighting by going fishing. Pokémon has three episodes centered around fishing: "Hook, Line, and Sinker" has Ash, Misty and Brock join in on the annual Seaking Catching Competition, which is entered also by Team Rocket, and the episode's featured trainer, Andreas. "A Fishing Connoisseur in a Fishy Competition" has Team Rocket orchestrate a fake fishing competition, in which Cilan participates in as a "fishing connoisseur", along with Bianca, who had never fished before. 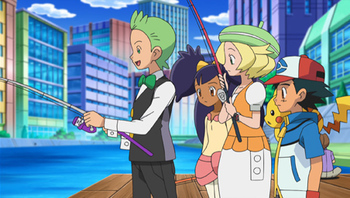 "Going For The Gold" involves Ash, Clemont, Bonnie and Serena going fishing to help a fisherman catch a Golden Magikarp. After Rapunzel's hair is cut and Mother Gothel falls to her death, Marluxia turns what is left of her into the Grim Guardianess, a [[WhenTreesAttack killer tree]] Heartless that can summon ensnaring flowers and root barriers, shed explosive seeds and sneezing pollen and can vomit killer black birds.